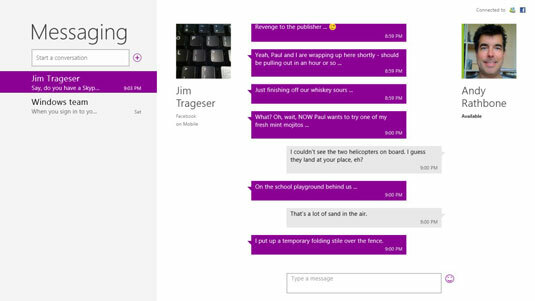 Windows 8’s friendly Messaging app on your Surface lets you type back and forth with any contact listed in your People app. It even handles the mechanics of facilitating inter-program banter: Your friend could be typing into Facebook’s instant messaging window while you’re typing back in the Messaging app’s window. From the Start screen, tap the Messaging tile. The Messaging app fills the screen. Tap the plus sign to the right of the Start a Conversation box. Shown in the top-left corner, the plus sign fetches the People app’s Online mode, which lists only friends who are currently online and available for chatting. If a friend doesn’t appear here, he’s either not online, not available for chatting, or not listed in your People app. Tap the name of the person you’d like to chat with. When the messaging window appears, begin typing. Your friend’s own messaging system, whether it’s on Facebook, a cell phone, or a different system, loads, letting them know you’re ready to start chatting with them. Type your message, and then press the Enter key. As you type, feel free to edit your message. Your message isn’t sent until you press the Enter key. When you press Enter, your message appears in your friend’s messaging program. When you finish chatting, simply stop typing, and move onto something else. Even when closed, the Messaging app keeps an archive of your conversation. And, when you two chat again, the archive grows longer. To delete a conversation, tap it; it becomes highlighted. Slide your finger up from the bottom of the Messaging app to fetch the App bar. Then tap the Delete icon. Don’t want to be bothered for a while? Tap the App bar’s Status icon, and choose Invisible from the pop-up menu. That keeps you from showing up as available in your friends’ messaging programs. To reappear to your circle of friends, tap the Status icon and choose Online from the pop-up menu. Don’t be too eager to type. Conversations flow best if you wait for a response before sending another message. Flurries of quick messages make for a disjointed conversation, like a debate full of interruptions. To monitor who’s online and ready to chat, open the People app and slide your finger up from the bottom to unveil the App bar. Tap the Online Only button to see friends available for chatting. Extended chats on a virtual glass keyboard can be difficult because the keyboard covers half of the screen. Switching to a USB, Bluetooth, or Surface keyboard lets your sparkling wit shine through that much more easily. At the time of this writing, the Messaging app works only with MSN and Facebook’s messaging services. 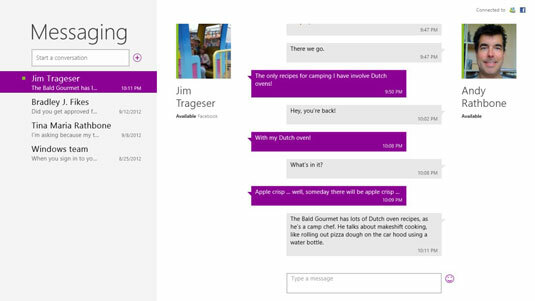 But Microsoft updates its apps regularly, so don’t be surprised to see other messaging services added.